Johann Christoph Friedrich von Schiller (German: ; 10 November 1759 – 9 May 1805) was a German poet, philosopher, historian, and playwright. 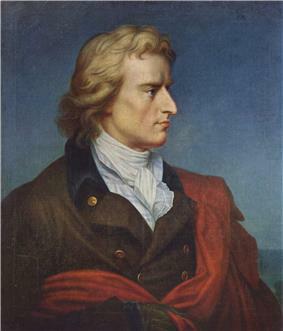 During the last seventeen years of his life (1788–1805), Schiller struck up a productive, if complicated, friendship with already famous and influential Johann Wolfgang von Goethe. They frequently discussed issues concerning aesthetics, and Schiller encouraged Goethe to finish works he left as sketches. This relationship and these discussions led to a period now referred to as Weimar Classicism. They also worked together on Xenien, a collection of short satirical poems in which both Schiller and Goethe challenge opponents to their philosophical vision. 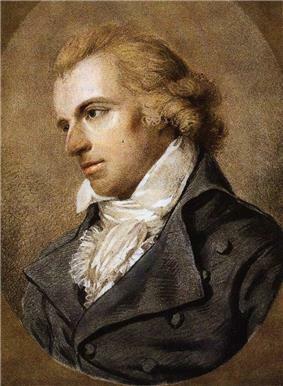 Friedrich Schiller was born on 10 November 1759, in Marbach, Württemberg as the only son of military doctor Johann Kaspar Schiller (1733–96) and Elisabeth Dorothea Kodweiß (1732–1802). They also had five daughters. His father was away in the Seven Years' War when Friedrich was born. He was named after king Frederick the Great, but he was called Fritz by nearly everyone. Kaspar Schiller was rarely home during the war, but he did manage to visit the family once in a while. His wife and children also visited him occasionally wherever he happened to be stationed. When the war ended in 1763, Schiller's father became a recruiting officer and was stationed in Schwäbisch Gmünd. The family moved with him. Due to the high cost of living—especially the rent—the family moved to nearby Lorch. 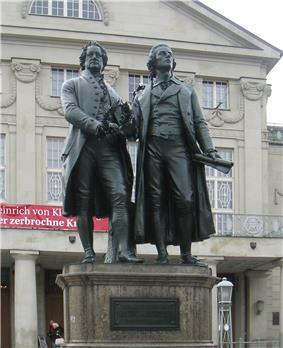 While at the Karlsschule, Schiller read Rousseau and Goethe and discussed Classical ideals with his classmates. At school, he wrote his first play, The Robbers, which dramatizes the conflict between two aristocratic brothers: the elder, Karl Moor, leads a group of rebellious students into the Bohemian forest where they become Robin Hood-like bandits, while Franz Moor, the younger brother, schemes to inherit his father's considerable estate. The play's critique of social corruption and its affirmation of proto-revolutionary republican ideals astounded its original audience. Schiller became an overnight sensation. Later, Schiller would be made an honorary member of the French Republic because of this play. 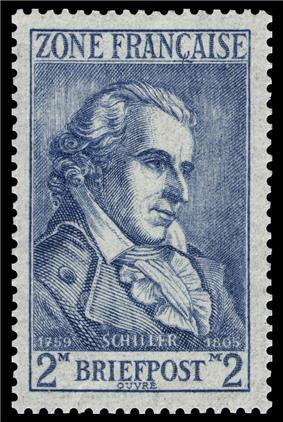 For his achievements, Schiller was ennobled in 1802 by the Duke of Weimar, adding the nobiliary particle "von" to his name. 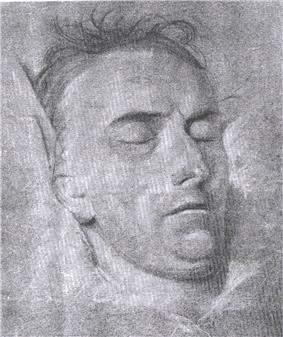 He remained in Weimar, Saxe-Weimar until his death at 45 from tuberculosis in 1805. 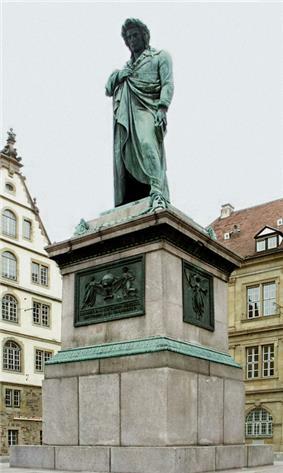 The city of Stuttgart erected in 1839 a statute in his memory on a square renamed Schillerplatz. 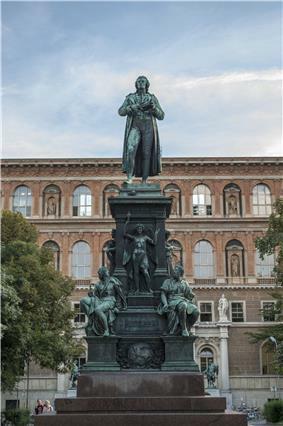 A Schiller monument was unveiled on Berlin's Gendarmenmarkt in 1871. Schiller has become an inextricable part of pop culture at the American undergraduate college, Carleton College, in Northfield, Minnesota. Several student groups on campus own busts of Schiller, which they show at popular campus events. Other students are set on stealing these busts. The Carleton's beloved "DVD Fest" has, in past years, been renamed "The Golden Schillers. The college has also named its student dollars "Schillers", and the "Schiller Society" is part of the admissions office. The Robbers (Die Räuber): The language of The Robbers is highly emotional, and the depiction of physical violence in the play marks it as a quintessential work of Germany's Romantic 'Storm and Stress' movement. The Robbers is considered by critics like Peter Brooks to be the first European melodrama. The play pits two brothers against each other in alternating scenes, as one quests for money and power, while the other attempts to create revolutionary anarchy in the Bohemian Forest. The play strongly criticises the hypocrisies of class and religion, and the economic inequities of German society; it also conducts a complicated inquiry into the nature of evil. Schiller was inspired by the play Julius von Tarent by Johann Anton Leisewitz. The Wallenstein Trilogy: These plays follow the fortunes of the treacherous commander Albrecht von Wallenstein during the Thirty Years' War. "Deeper meaning resides in the fairy tales told to me in my childhood than in any truth that is taught in life." 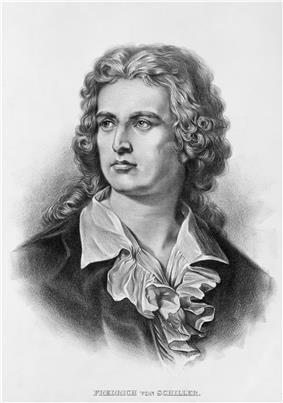 There are relatively few famous musical settings of Schiller's poems. Two notable exceptions are Beethoven's setting of "An die Freude" (Ode to Joy) in the final movement of his Ninth Symphony, and Johannes Brahms' choral setting of "Nänie". In addition, several poems were set by Franz Schubert as Lieder, such as "Die Bürgschaft", mostly for voice and piano. In 2005 Graham Waterhouse set Der Handschuh (The Glove) for cello and speaking voice. ^ Lahnstein 1981, p. 20. ^ Lahnstein 1981, p. 20–1. ^ Lahnstein 1981, p. 24. ^ Lahnstein 1981, p. 25. ^ Lahnstein 1981, p. 27. ^ "CarlTown: No access". Carltown.carleton.edu. Retrieved 6 November 2013. ^ "Carleton College: The Golden Schillers: Carleton's Student-Produced Film Festival". Apps.carleton.edu. Retrieved 2013-11-06. ^ "Carleton College: OneCard: Schillers Terms and Conditions". Apps.carleton.edu. Retrieved 6 November 2013. ^ "Schiller Society". Apps.carleton.edu. 3 November 2012. Retrieved 6 November 2013. ^ "Beethoven: the man and the artist, as revealed by his own words, Project Gutenberg.". Retrieved 20 November 2011. Lahnstein, Peter (January 1984) . Schillers Leben. Frankfurt am Main: Fischer.